The Supreme Court of Pennsylvania has suspended the law license of the Democratic state attorney general Kathleen Kane, who is currently faces eight criminal charges and could see another felony tacked on shortly. The court issued the order on Monday morning, the website Politics PA reported. "The suspension is temporary but it does raise questions about whether it makes Kane ineligible for her office," Politics PA’s managing editor, Nick Field, wrote. Kane announced in August that she will run for reelection next year despite facing a number of criminal charges related to allegations that her office leaked information about a grand jury investigation in an attempt to embarrass a high-profile critic. The Supreme Court’s order came days after the Philadelphia Inquirer reported that Kane may have violated an oath signed in January 2013 pledging not to divulge details of any grand jury investigations. That could result in another perjury charge on top of the one she already faces, Field wrote. Kane is a prominent supporter of Hillary Clinton, having worked for her 2008 presidential campaign. 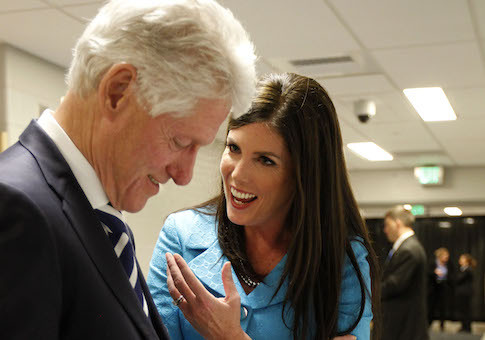 Bill Clinton has been a prominent supporter of Kane’s political campaigns. This entry was posted in Issues and tagged Hillary Clinton, Pennsylvania. Bookmark the permalink.